Keeping Abreast in Victoria: Breastfeed! Where did you do it today? The Manning/Great Lakes group is proud to announce a fantastic new photography competition open to everyone throughout Australia. First prize $100 and a viewer's choice prize of $50.The more that enter, the more prizes we will be able to have. What sort of photos? 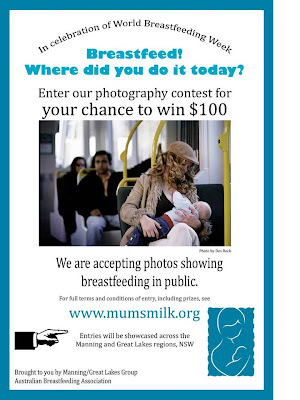 We are accepting photos showing breastfeeding in public. $5 entry fee for those submitted by mail (printed photo 6'x8' in size) or $8 entry fee to enter by emailing your photo (max 2MB) to ababec@hotmail.com (we will print it for you). Please email Nicole if you would like a copy of the flyer and entry form. Details are also available on our group website http://www.mumsmilk.org/ (including entry form and terms and conditions of entry). The photos will be showcased across the Manning and Great Lakes area during the month of August in celebration of World Breastfeeding Week. So get clicking, you don't have long. Competition closes 1 August. Please feel free to pass this information on to any you feel would love to get a chance to win!